On November 1st the Thor: Treasures of Asgard The Bifrost exhibit opened at Disneyland's Innoventions. The Bifrost has opened between Earth and Asgard—and you’re invited to come explore a world of gods. Embark on a journey across this “cosmic bridge” connecting Innoventions at Disneyland park with the home world of Thor, the Mighty Avenger—and star of the film Thor: The Dark World. 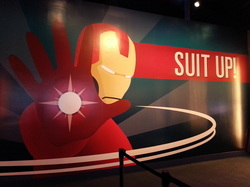 The Iron Man exhibit is still available in the Innoventions attraction in Disneyland even though it was scheduled to leave at the end of the summer 2013. View authentic movie armor from Iron Man 3. Learn about the technology behind the Iron Man suits. See yourself virtually suiting up in pieces of the latest Mark 42 armor on a video screen display, through the wonder of augmented reality technology. You can even virtually test some of the cool features of the suit out!